André du Dauphiné has a passion for beauty that inspires and drives them. The materials and the techniques they work with reflect that passion. Silk is the most sensuous, the most intensely aesthetic of all textiles, that is why they have dedicated themselves for half a century almost exclusively to Silk and set out to provide their customers with the largest collection of silk fabrics ever created. In a time of mass production and product standardization André du Dauphiné believe in individuality and bespoke manufacture, in the beauty of hand craft and in products that can express their and your creativity, enabling you to play with sheer endless possibilities. Using techniques and recipes carefully preserved and guarded over centuries, André du Dauphiné supplies traditional hand-produced products that meet the demanding expectations of a modern world. In an intricate procedure, comprising of twelve individual steps, their fabrics are painstakingly brought to life using old tools and equipment. Many skilled hands, with a tremendous feel for colour are necessary to produce every metre of finest silk, cotton or velvet. 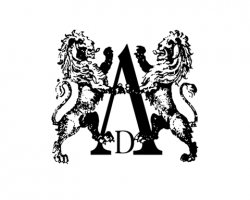 André du Dauphiné’s master craftsmen, team of printers and dyers pride themselves in a dedication to their craft which is the bedrock of the reputation that André du Dauphiné enjoys today.